1. Main overall ranking based on total listeners (1-100). 2. 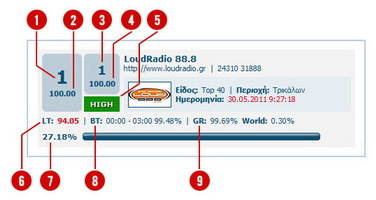 Rating based ranking of the main overall listeners (0-100). 3. Secondary general classification based on the ratings (1-100). The audience count of all the listeners and total listening these years. 4. Rating based on a secondary classification of the ratings (0-100). 5. Calculation of high or low ratings. When the average listening rate is less than 1 minute listening time per listener for the given set of listeners, then we have "LOW", otherwise it is "HIGH"..
7. Percentage of main TOP100 ranking of all stations (0-100). 8. The best 3-hour time period in listeners and rate it.